Thank you for joining me as we count down to the next MFT release. We are four days away from the big day! All the new Stamps, Die-namics, and Stencils will be available on Tuesday, September 16th at 10:00pm EST. Be sure to check out the MFT Blog to see all the new items being revealed today. Don't forget to leave a comment on the MFT Blog Countdown posts, YOU could win one of the seven $75.00 gift vouchers. I have two cards to share with you tonight, I used this month's Color Palette Challenge as my inspiration for both of them. You can find all the details about the monthly Color Palette Challenge HERE. I die-cut the You've Got Mail envelope in Factory Green card stock. I added a little ink to the edges and I sealed it with a Wild Cherry heart and a S.W.A.K Pierced Fishtail Flag. The gorgeous argyle pattern is one of the stamps in the new Diamonds and Dots stamp set. The sentiments are all from the previously released You've Got Mail stamp set. My second card was also inspired by this week's Wednesday Stamp Club Sketch. This card features a number of new items from this release, the Diagonal Bars Stencil, You've Got Mail Die-namics, and the Many Thanks Die-namics. I used the Diagonal Bars Stencil with Steel Blue Hybrid Ink to create the background. The envelope was die-cut in Steel Blue card stock and it was sealed with a stamp from the Sending Thanks stamp set. This previously released set works so well with the new You've Got Mail stamps and Die-namics. 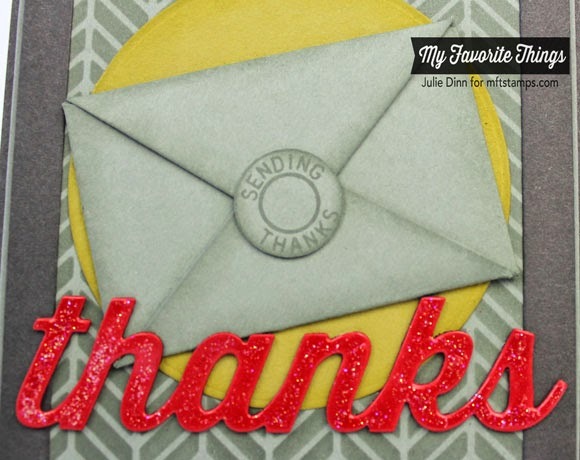 The thanks die-cut is one of three thanks in the new Many Thanks Die-namics. This set of dies is our new Free with $60 set for the month! You can read all about the Free with $60 promotion HERE. I die-cut the thanks in Wild Cherry card stock and I coated it with some Sheer Sparkle Glitter Glaze. I kept the inside of the card fairly simple. 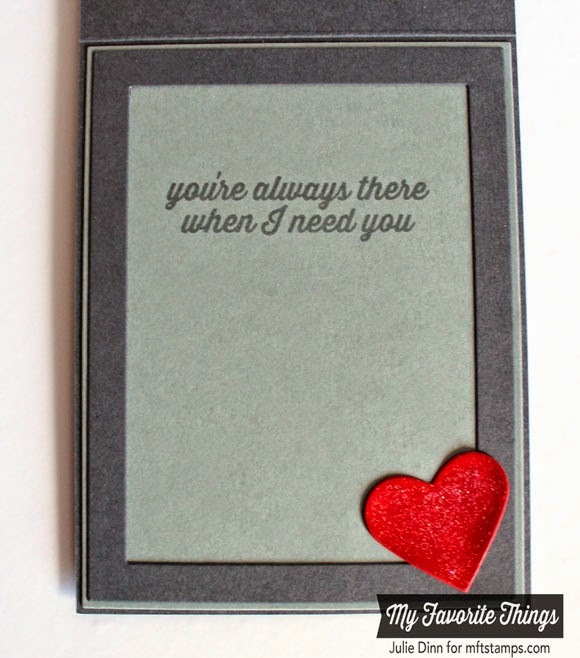 The sentiment is from the Sending Thanks stamp set. Thank you so much for stopping by today. Be sure to check out the MFT Blog to see all the gorgeous creations the Design Team has to share with you. Julie I love that envelope die... have used it often! Can't tell you how excited I am about the Free dies!! Your first card you used one of my "becoming a favorite" stamp--Diamonds and Dots. You've done a good job on your projects. GF, these are awesome! Love the grey with the red and green!